On our way to town this morning we stopped by Ray's Bitchen Kitchen to reserve a whole smoked chicken to be picked up later on our way home. 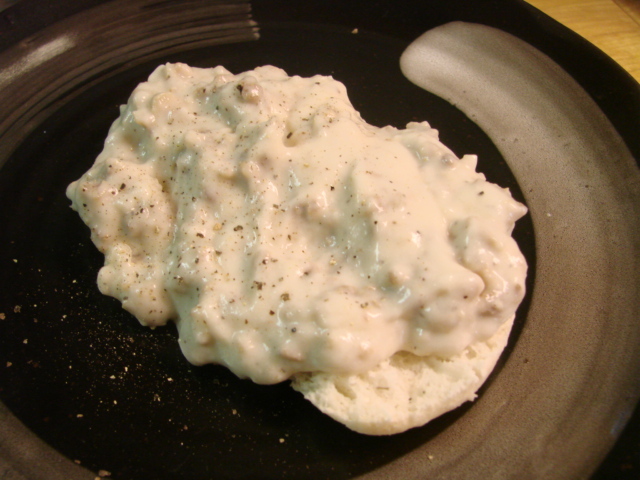 In my conversation with Ray I told him we were going to go out for some biscuits and gravy for breakfast. Boy!! his eyes lit up and he fixed us a little bowl of his biscuits and gravy to sample. We ate it on our way to town. Stan said, now this is what I've been talking about, he must have said that at least three times. I was driving and he was spoon feeding me, I felt like a little baby bird. More than once I had to tell him to put a little more gravy on that biscuit. Later when we picked up the chicken I wanted to buy some gravy for Stan to have for breakfast tomorrow morning, but all he had left was about half a serving so he gave it to me, What a guy!!!. I plated it with one of the biscuits he gave me so I could get a photo of it. Honest, I didn't eat it, Stan will get it with his eggs in the morning. Look at all that good sausage in there, excellent. 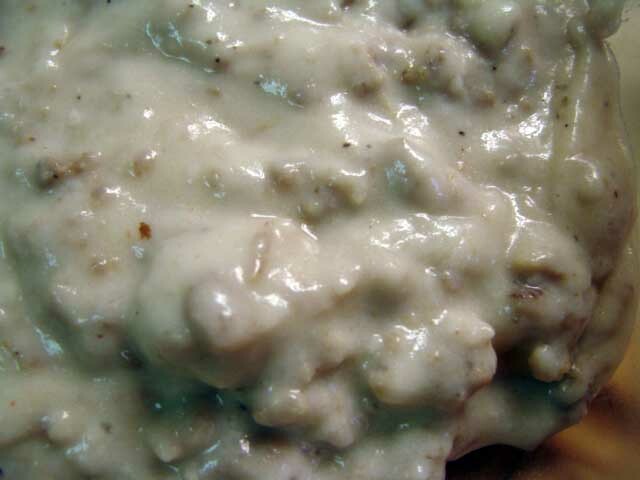 The consistency and flavor are perfect and there is no flour taste or residue. Stan says this will be hard to beat. 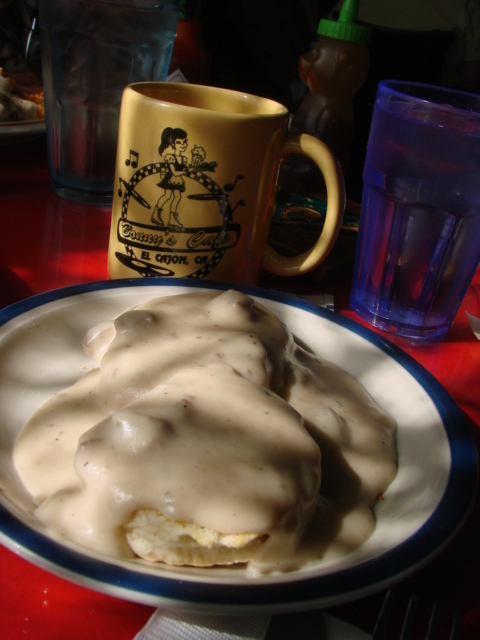 We went ahead and had some biscuits and gravy at Bonnie's Cafe anyway. I wanted to taste them one right after the other. There is just no comparison, the photos will tell you that. 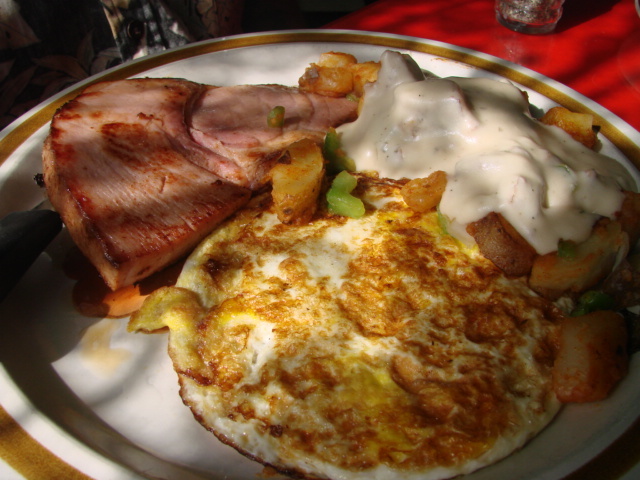 We've always had great food at Bonnie's. 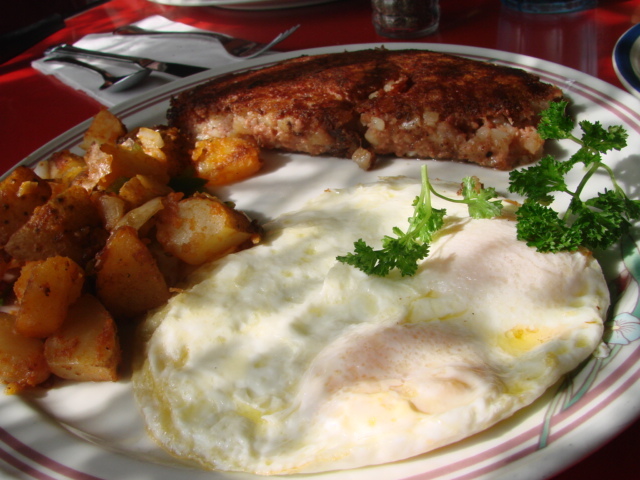 It's a great diner and I can get my favorite breakfast of corned beef hash and eggs over easy. Stan doesn't like runny eggs, he likes his eggs cremated so he usually orders them scrambled.Today he decided to order them fried over hard. He got what he asked for Blech!!! but the rest was good. I'm hoping I'll get a little bite of Stan's breakfast tomorrow morning. Heck, I'm cooking it, that's a given.